The Subsea Cable will link the US to Spain with 160 Tbps capability. Microsoft (NASDAQ:MSFT) and Facebook (NASDAQ:FB), in partnership with Spain’s Telefónica telecommunications infrastructure subsidiary Telxius, will lay a subsea, trans-Atlantic cable data system christened “MAREA” from the Spanish word meaning “Tide”. Telxius with its extensive experience in subsea cables, will operate and manage the MAREA system which will be 6,600 kilometers (4,101 miles) long, connecting Virginia Beach, US to Bilbao, Spain where the system will further extend to terminal hubs in Europe, Africa, the Middle East and Asia. With 160 Tbps capability initially, consisting of 8 fiber pairs, the system is “open” designed to enable integration with diverse range of networking equipment. The MAREA design will benefit customers with features like lower costs, easier upgrades, and quick upgrades in bandwidth as the system will “evolve at the pace of optical technology innovation.” Starting in August 2016 and expected to be operational by October 2017, the system will become the highest-capacity subsea cable to ever cross the Atlantic. “By creating a vendor-agnostic design with Microsoft and Telxius, we can choose the hardware and software that best serves the system and ultimately increase the pace of innovation,” Najam Ahmad, vice president of network engineering at Facebook wrote in a statement, noting that Facebook envisions further similar projects to improve efficacy and collaboration. The robust system will enable better data experiences in cloud computing and Facebook is of the belief that the MAREA system is a future proofed design. The MAREA system is not solely for Microsoft and Facebook as Telxius will also sell off the system’s data capacity to other companies. 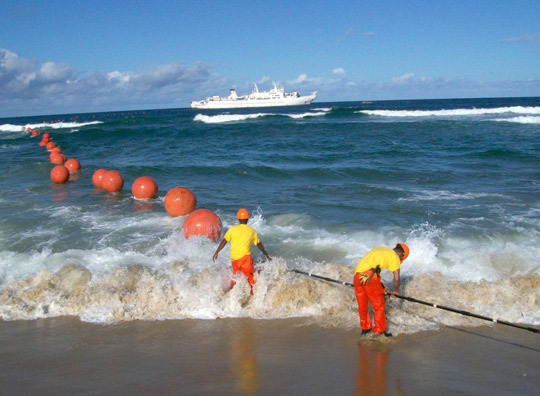 The MAREA route, further south from the majority of cabling systems, will likely facilitate “resilient and reliable” data connectivity, for which many services of Microsoft and Facebook are on the look out. Facebook has a massive 1.6 billion users, excluding services like Instagram and Whatsapp. For Microsoft, its Azure cloud services utilises huge amounts of bandwidth, excluding its other cloud-based products like Bing, Office, Skype and Xbox Live. Microsoft and Facebook have previously made investments to improve connectivity across oceans and continents. Frank Rey, director, global network acquisition, Microsoft Corp. said that the world continues to move towards a cloud-based future, Microsoft is working to build a global infrastructure to support reliable and low-latency connectivity for cloud services. Microsoft also announced a partnership with Hibernia and Aqua Comms for a cross-Atlantic project with high-speed data cable connectivity between Microsoft’s data center infrastructure in North America, Ireland, and the UK, in May 2015. Facebook too invested in a 10,000-kilometer (6,214-mile) cable system named the “Asia Pacific Gateway” for enhanced connectivity for people and businesses. The cable was laid from Malaysia to South Korea and Japan, and was also extended to different countries in 2012. Receive Facebook News & Ratings Via Email - Enter your email address below to receive a concise daily summary of the latest news and analysts' ratings for Facebook with MarketBeat.com's FREE daily email newsletter.